I have some good memories of me and my older brother playing Mickey Mouse games on the SEGA Genesis and Super Nintendo when I was a young kid. While spacing out sometimes I hear those wonderful nostalgic 16-Bit music tunes from games like World of Illusion, and Castle of Illusion, which instantly brings a smile on my face. That nostalgia inspired me to write this article. 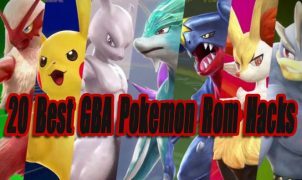 In preparation for this top list, I researched and played 17 of the most popular Mickey Mouse video games via PC console emulation and game consoles. 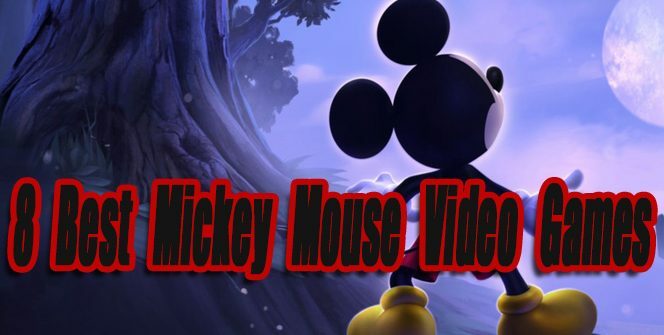 In this article, I list the 8 best Mickey Mouse games released so far. I have also included a list of notable games Mickey Mouse has appeared in and an honorable mentions list. When new worthy games are released this article will be updated. Disney’s Magical Quest 3 originally released exclusively in Japan on the Super Famicom in 1995 and is the 3rd game in the Disney’s Magical Quest series. Disney’s Magical Quest 3 was later re-released for the Gameboy Advance in Europe and North America. 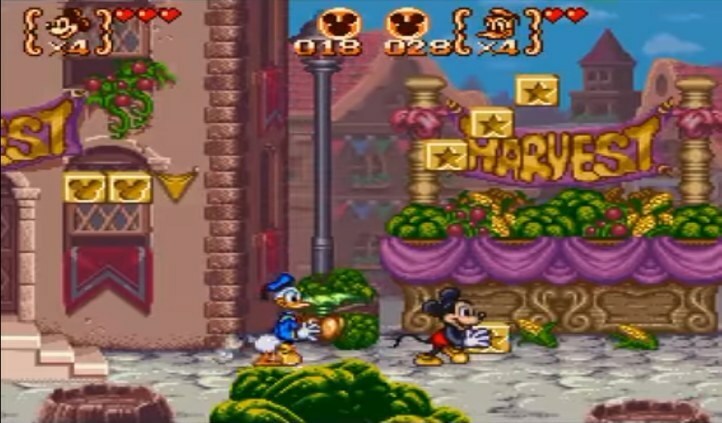 In this game, you can play as either Mickey Mouse or Donald Duck. In the Japanese Super Famicom version, you can play with 2 players at the same time. The story is decent for a classic platform game. Donald Duck’s triplet nephews discover an old book in his attic. This book is magical and transports the nephews to a new land full of Knights, wizards, and fantasy. In this new land, the evil Pete ends up capturing the nephews. Mickey and Donald must enter the magical book to save Donald’s nephews. Overall I enjoyed this game but I thought the level design, enemies, music, and bosses were a little plain compared to other games in the Magical Quest series. The Great Circus Mystery Starring Mickey and Minnie was the 2nd game released in the Disney’s Magical Quest series. Choose from Mickey or Minnie to play as. This game is most fun when played with 2 players. The story is mediocre at best, but what can you really expect from a 16-bit platform game story? After traveling on a bus Mickey and Minnie arrive at a circus. Goofy alerts them that the circus and people have disappeared. Now Mickey and Minnie must find out who’s behind this tragedy. Besides “World of Illusion” this is the next best 2 player Co-Op Mickey Mouse game. It’s not too hard, so it’s the perfect game to play with young children. I love the level design, suits, and enemies in this game. Different outfits become available to use as you progress through the game. Each outfit has special power attributes that change up the gameplay. 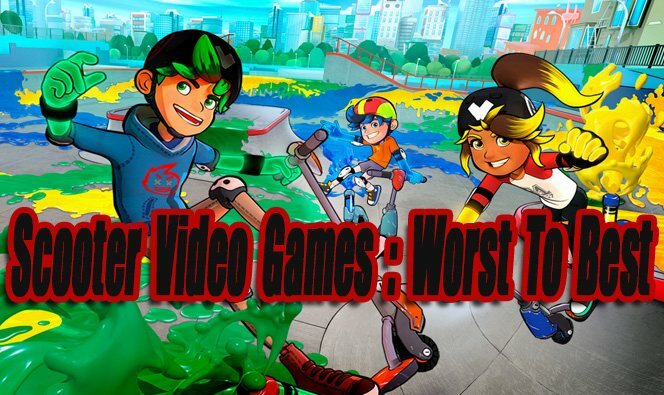 The Great Circus Mystery isn’t as memorable as the top-ranked games on this list. It’s still a solid game though and worth playing with another player. 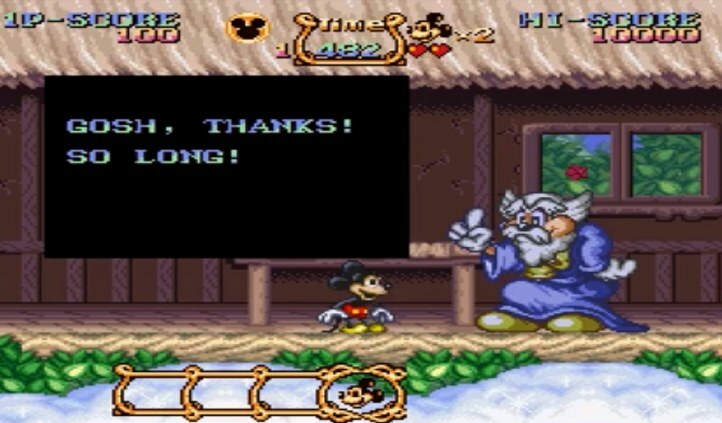 The Magical Quest Starring Mickey Mouse was the first game released in The Magical Quest series and also the best Mickey Mouse game on the Super Nintendo and Gameboy Advance. I remember when I was a kid me and my brother were blown away by the graphics in this game. When playing it today the graphics still hold up well, but the character animations look weird at times. The story and NPC characters in this game are better than the other two Magical Quest games. The game starts off with Mickey, Donald, Goofy, and Pluto playing catch in the park. Goofy accidentally throws the ball too far and Pluto goes running after it. Pluto never comes back and everyone scatters looking for him. Mickey falls off a cliff and ends up in a weird magical land. Later Mickey meets a wizard who tells him Pluto was captured by Pete. Playing as Mickey you will travel across 6 different levels, fight bosses, unlock outfits and try to save Pluto. 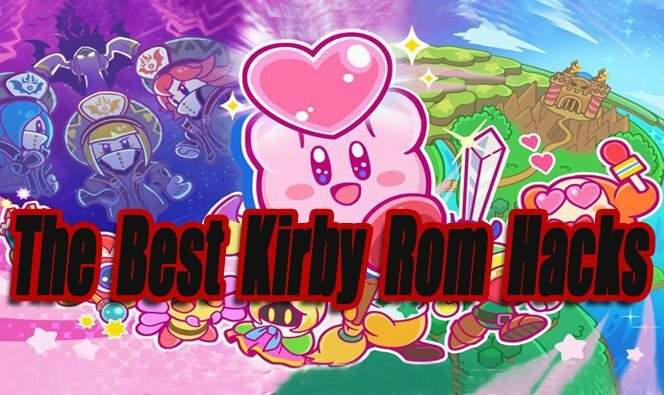 Overall I liked the pacing, varied level design, up-gradable outfits, bosses, and music more than the other two Magical Quest games. 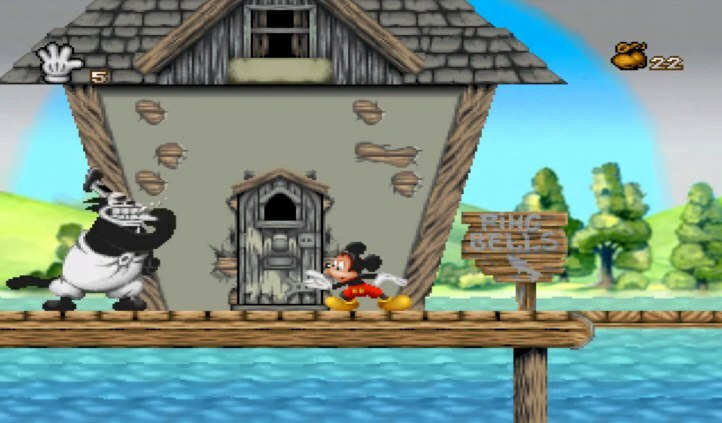 It’s not perfect though, and it’s one of the shorter Mickey Mouse games available. If you own (or emulate) a Super Nintendo, this game does offer a memorable single player 16-Bit platforming experience. Mickey Mania doesn’t have much of a story, but it showcases fantastic gameplay, character animations, music, and level design. I loved playing through the varied levels, they have a unique theme to them. 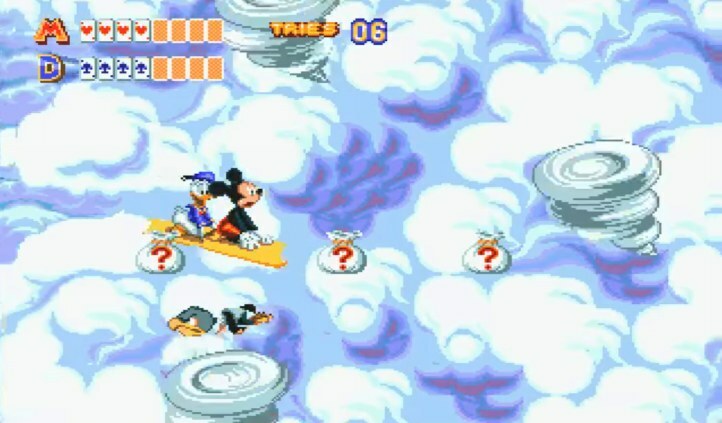 The levels in Mickey Mania are based on classic Mickey Mouse cartoons. A lot of gamers say Mickey Mania is too easy, I always thought it was decently challenging compared to other Mickey Mouse games. The best version of Mickey Mania is the PlayStation PAL region release renamed “Mickeys Wild Adventure”. This version has reworked background graphics, better-colored textures, and superb audio. The SEGA CD version is also good with smooth graphics and nice CD quality music/sound. 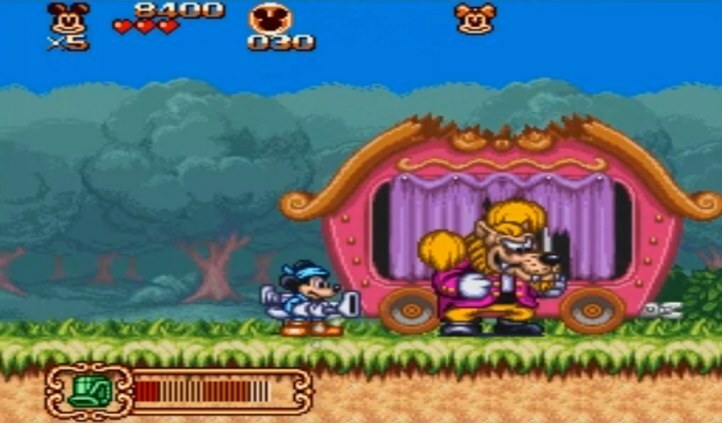 Mickey Mania was also released on the Sega Genesis and Super Nintendo. I can’t recommend these versions because they’re inferior in every way to the SEGA CD and PS1 versions. The Super Nintendo version is especially bad and is even missing a level. Epic Mickey has a lot of faults, but it’s still the best 3D Mickey Mouse game released so far. After Mickey enters Yen Sid’s (Sorcerer from Fantasia) workshop, he finds a Magical Paintbrush. With the magical paintbrush, Mickey tries to edit the painting Yen Sid created, by painting in a self-portrait of himself. He ends up messing up the painting and creating an evil shadow blot instead. Mickey tries to fix the painting but he ends up making it worse. The painting turns into a portal and Mickey gets is sucked into it. Mickey is now trapped in a broken world full of his past history. Now Mickey must repair this world with his paintbrush and destroy the Shadow Blot. When it comes to story, characters, level design and gameplay elements Epic Mickey really does shine. I had a lot of fun painting and platforming through the varied levels and solving clever yet simple puzzles. The game is 15 plus hours long. It has good pacing and tons of optional collectibles to find. The controls and camera system can feel a little frustrating at times, dulling down the experience. Overall Epic Mickey is an above average game, and worth checking out if you own a Wii. 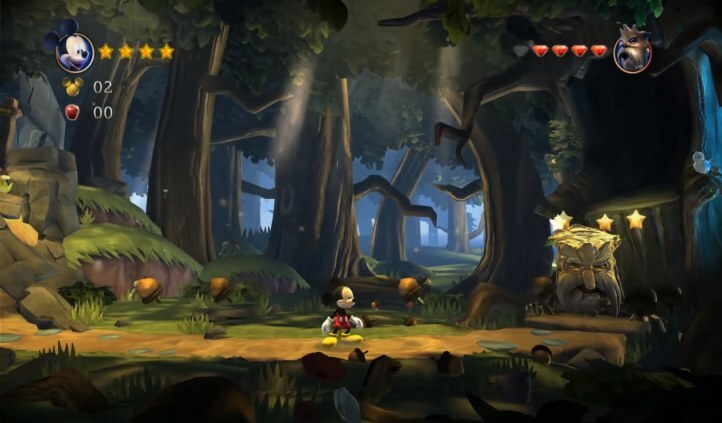 The 2013 remake release of Castle of Illusion Starring Mickey Mouse does not disappoint, but I still prefer the Sega Genesis classic over the remade version. The remake has much better graphics and a lot of its level design has been converted nicely to 3D. The game feels unique to the original, but it lacks the charm the original has. The remake is much easier than the original, which is a negative for me because I like a little challenge in my games. The music has been tweaked for the worse, and most of the re-created 2D/3D levels are not as memorable as the original 2D levels. It’s still a good game overall and fun to play. Gamers that can’t stand outdated 16-Bit 2D graphics will likely prefer the remake over the original. World of Illusion Starring Mickey Mouse and Donald Duck was a big part of my video gaming childhood. World of Illusion’s story is thin, but at least it has one. While practicing for a magic act Mickey and Donald discover a large magical box. Mickey and Donald walk into the magical box not knowing they would be teleported to an unknown magical world. The magical box was a trap set by Pete. Now Mickey and Donald must try to find a way back home. World of Illusion’s graphics, gameplay, character animations, music, bosses, and level design are really impressive for a SEGA Genesis game. This game is most fun when played with 2 players. There are different obstacles in each level that will require you and another player to work as a team. The level design is set up nicely, it isn’t overly challenging, but it’s not easy either. If you’re looking for a short but fantastic 2 player Mickey Mouse experience, give World Of Illusion a try. The original Castle of Illusion Starring Mickey Mouse for the SEGA Genesis is still the best Mickey Mouse game ever made. The story starts off with Mickey and Minnie enjoying life in the peaceful Vera City. A dark jealous witch named Mizerabel appears and captures Minnie. 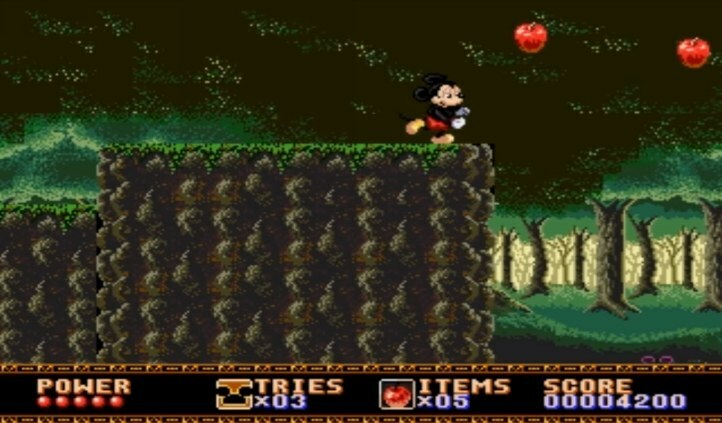 Mickey chases Mizerabel, only to find out she has taken Minnie to the mysterious Castle Of Illusion. Outside of the Castle Of Illusion Mickey meets an old man that tells him Mizerabel plans on changing herself to look like Minnie and Minnie will change to look like an evil witch. Now Mickey must find the 7 gems of the rainbow, in order to gain enough power to destroy Mizerabel. Everything about this game is very memorable. The music, varied level design, challenge, and bosses were Castle of Illusions highlights for me. While playing this game in 2018, the 16-Bit graphics and gameplay do feel outdated, but the charm, memories, and fun factor is still there! For a game released in 1990 Castle of Illusion is nearly perfect, and it’s one of the best platform games on the SEGA Genesis. A Side Note: Sega Master System and SEGA Gamegear consoles released there own versions of Castle of Illusion also, but those versions weren’t nearly as good as the SEGA Genesis version. These games are not based on Mickey Mouse. Mickey has serious roles in them though when it comes to story or character presence. 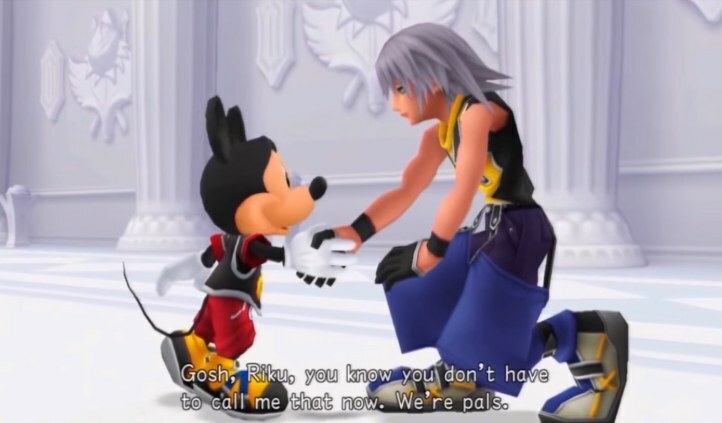 Mickey Mouse plays a major character role in the story of most Kingdom Hearts games. 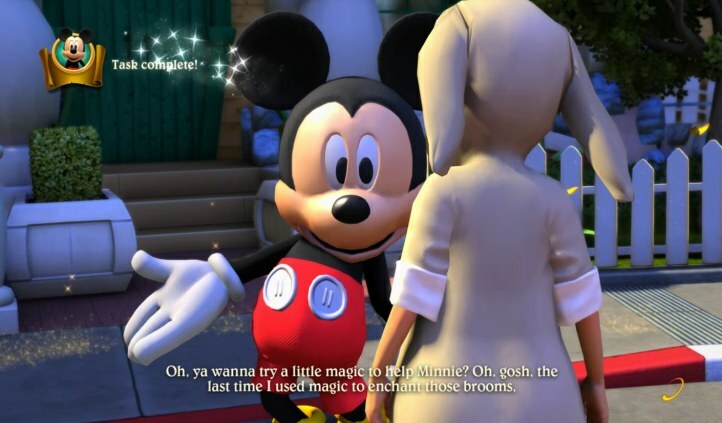 Mickey appears more than any other Disney character in these games. He’s also an optional playable character in a few Kingdom Hearts games. If you like Japanese Role Playing Games, and you want to see Mickey, Goofy, and Donald beat down enemies, Kingdom Hearts are must plays. Mickey appears a lot in Disneyland Adventures. Playing as a kid, Mickey is a Messenger that teaches you how to play the game. Mickey also directs you to different Disney characters and areas around Disneyland. these might be worth checking out! 9. Land of Illusion Starring Mickey Mouse (Master System, Game Gear) – I almost placed this game in the 8th ranked spot. It’s the best 8-Bit Mickey Mouse game released. The graphics and sound are outdated, but the simple gameplay mechanics and level design are top-notch for a retro game. This is actually one of my favorite platform games for the SEGA Master System. If you don’t mind outdated 8-Bit graphics, I recommend checking out this hidden gem. Mickey’s Speedway USA (Nintendo 64) – A hidden GEM created by Rare. It’s not as good as the Rare-developed “Diddy Kong Racing” game. For a Mickey Mouse themed racing game, it’s fun. It’s a good starter game for kids learning how to play racing video games. Mickey’s Racing Adventure (Gameboy Color) – This was one of my favorite racing games on the Gameboy Color. The well-designed land and water racing tracks are so addicting to race on. Mickey’s ABC – A Day at the Fair (MS-DOS PC) – An older but still useful high-quality educational game for youngsters. This game teaches kids the A,B,C’s. The Mickey animations are entertaining to watch. 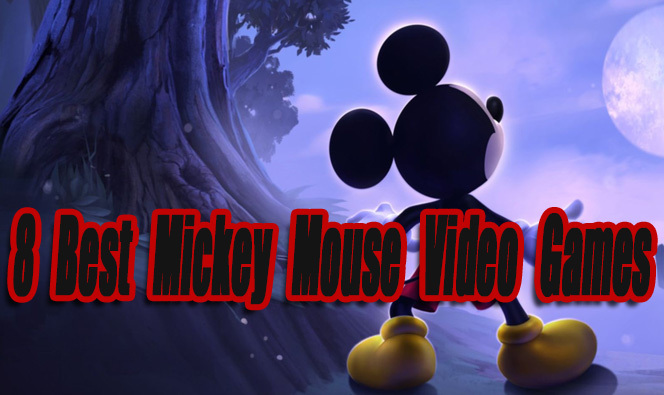 – A Side Note: In the comments please don’t say “Where’s Epic Mickey 2: Power Of Two?” lol. 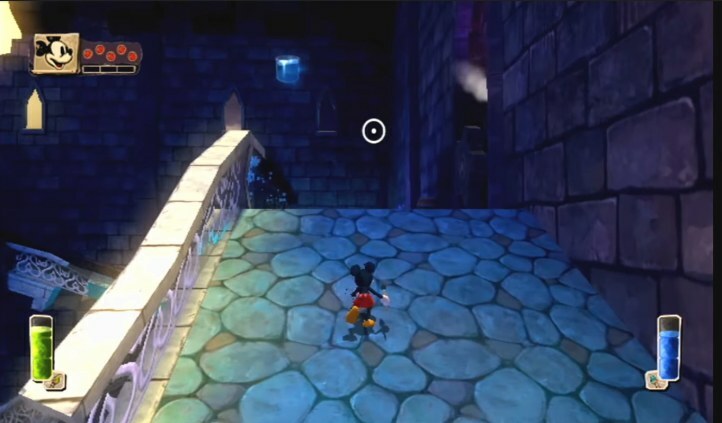 I thought Epic Mickey 2’s level design was terrible and boring. Its 2 player gameplay mechanics felt nearly broken and almost unplayable. I know a lot of people like this game, but I don’t, and I will never recommend it! I thought part 1 was better in every way.